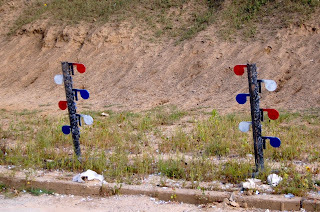 ...But I'm still spinning from attending Spartan Tactical Training Group's excellent "Advanced Pistol 1: Developing Reflexive Gun-handling Skills" class, tornados be damned! 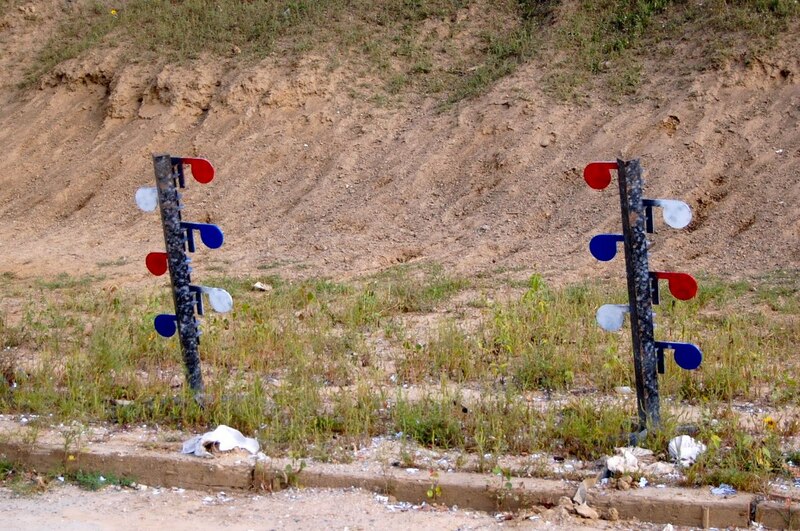 Taught by John Krupa III and Vince Jamison, whose combined curriculum vitaes read like laundry lists of every possible cool shooting courses ever known, the course focused on, (surprise...) the development of reflexive pistol-handling skills. Most of the classroom teaching was delivered by Krupa, who is a fantastic instructor with a very witty, down-to-earth demeanor, delivering information with great humor and gusto. The core of the class focused on developing the "Natural Action Stance", which had been developed through research identifying the stress-reactions of people in aggressive confrontations. It compliments the body’s natural tendency to square to a threat, lean forward slightly, and get mobile (weight on balls of feet). Being a boxer, I found that the stance mimicked the "peek-a-boo" stance very closely. After stance development, a heavy emphasis was placed on moving laterally off the line of force. 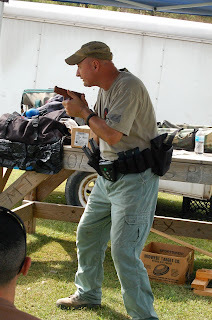 Krupa stated that the reason a new, stress-compatible posture was necessary in training is because many agencies (Krupa and Jamison are both law enforcement) focus on basic weapon familiarization and that there is a significant disconnect between a department qualifier and the real world. He dug out hard statistical data (FBI 2005), which showed that the same officers that are required to perform 70% or better on qualifiers hit only 18% of the time in real situations. He further argued that the rank-and-file’s averages are probably even worse since the statistics include SWAT and Rapid Response teams who are usually better trained and equipped. 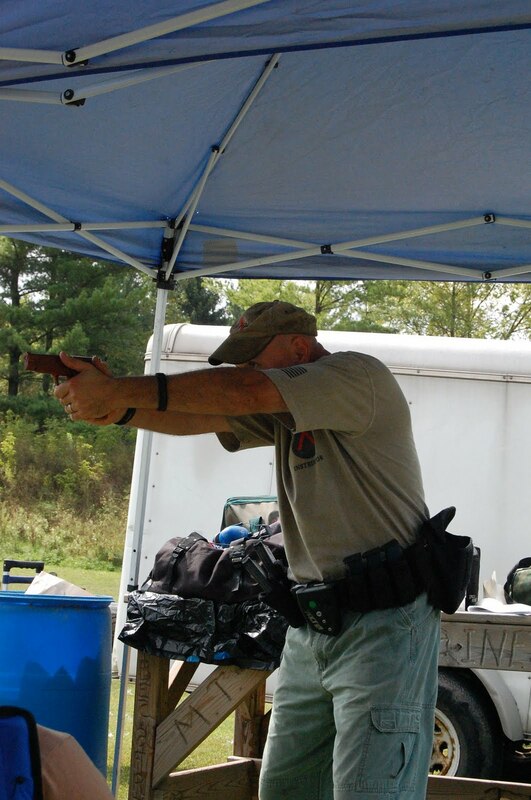 With footwork in place and assessed under Jamison's careful tutelage, the pistol was added in a self-indexing thumbs forward grip which enabled the student to point naturally, using the thumbs, at the target. 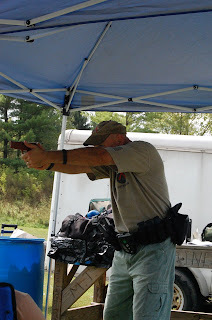 We then practiced moving the pistol out, lining up the sights, breaking a shot, following through with a second sight picture of the target before resetting to the ready position. Next, Krupa and Co. would give either verbal commands or audible Pact timer beeps to ingrain a "step laterally, fire a number of shots" reflex into the students. We worked running the gun from 2-6 shots on a steel plate, which provided instant audible assessment to the student before breaking for lunch. degree area around the student (keep on the lookout for multiple attackers). The final phase moved into team and individual shoot-offs which assessed the amount of material retained by each student when external stress was added to the mix. 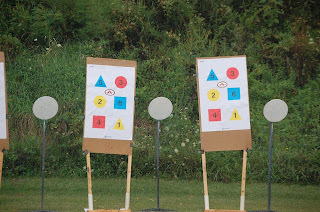 When you take into account the sheets of rains, tornado sirens and the some excellent shooter, the shoot-offs were a very novel way of building tension and forcing students to put into practice what had been learned the first half of the day - now, if my hand would just stop burning from the “GLOCK Finger” affliction, I’d be happy!